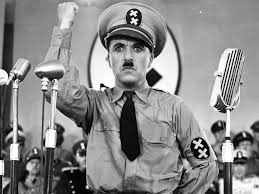 One of Ben Urwand’s chief claims in his THE COLLABORATION: HOLLYWOOD’S PACT WITH HITLER, is that Jews virtually disappeared from Hollywood films after Hitler “came to power,” owing to Hollywood greed in preserving their business with Germany . 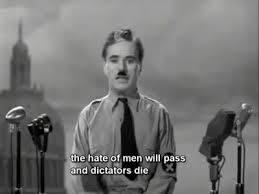 One of his examples compares the copyrighted 1938 version of THE GREAT DICTATOR to the version released in 1940. [Urwand, p.219] …Back on November 10, 1938, when the first reports of Kristallnacht were hitting American newspapers, Chaplin had rushed the first version of his story to the U. S. Copyright Office. …Hinkle [sic] the dictator of Ptomania, had devised a scientific test to separate Jews from Aryans. All Jews were sent to concentration camps, and one named Charlie, who bore an uncanny resemblance to Hinkle, broke out. He was mistaken for the dictator, and he gave a speech that convinced the country to abandon fascism. Suddenly music filled the streets. Everyone started dancing. Prisoners were released from the camps. Storm troopers were dancing with Jews. Even now my voice is reaching millions throughout the world, millions of despairing men, women and little children, victims of a system that makes men torture and imprison innocent people. To those who can hear me I say: do not despair. The misery that is now upon us is but the passing of greed, the bitterness of men who fear the way of human progress. The hate of men will pass and dictators will die, and the power they took from the people will return to the people and so long as men die liberty will never perish. Soldiers: don’t give yourselves to brutes, men who despise you and enslave you, who regiment your lives, tell you what to do, what to think and what to feel, who drill you, diet you, treat you as cattle, as cannon fodder! Don’t give yourselves to these unnatural men, machine men, with machine minds and machine hearts. You are not machines! You are not cattle! You are men!! You have the love of humanity in your hearts. You don’t hate, only the unloved hate. The unloved and the unnatural. Soldiers: don’t fight for slavery, fight for liberty! In the seventeenth chapter of Saint Luke it is written: – “The kingdom of God is within man.” Not one man, nor a group of men, but in all men: in you! You the people have the power, the power to create machines, the power to create happiness. You the people have the power to make this life free and beautiful, to make this life a wonderful adventure. Then, in the name of democracy, let us use that power, let us all unite! Let us fight for a new world, a decent world that will give men a chance to work, that will give you the future and old age and security. By the promise of these things, brutes have risen to power, but they lie. They do not fulfil their promise, they never will. Dictators free themselves but they enslave the people. For more details on the making of The Great Dictator, see http://en.wikipedia.org/wiki/The_Great_Dictator. 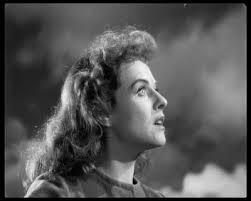 It is worth noting that Paulette Goddard, a fighting Jew in the movie, ends the film listening to the speech on the radio, moves from despair to optimism, with her eyes lifted to the sun breaking through the clouds, confirming the message of Enlightenment and activism on behalf of humanity. The gesture is resonant with, but not identical to, the Christian gaze to Heaven for inspiration and eternal life.